In 1920, financier E.R. Wood and his wife Agnes purchased lands located where York University’s Glendon College is currently situated. They also purchased 52 undeveloped plots of land in the east section of Lawrence Park. 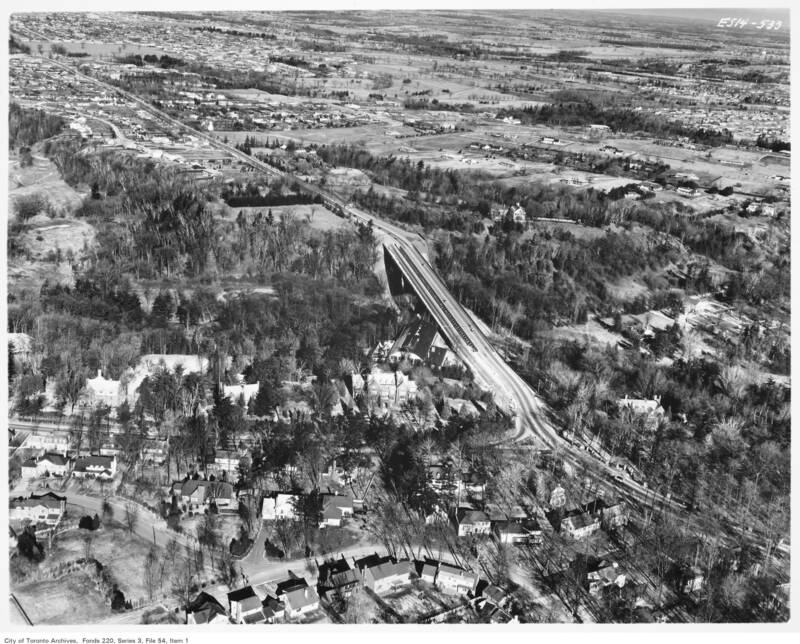 The Woods set about creating a grand estate on the former farmlands of their new property, and by 1924 had moved into Glendon Hall. 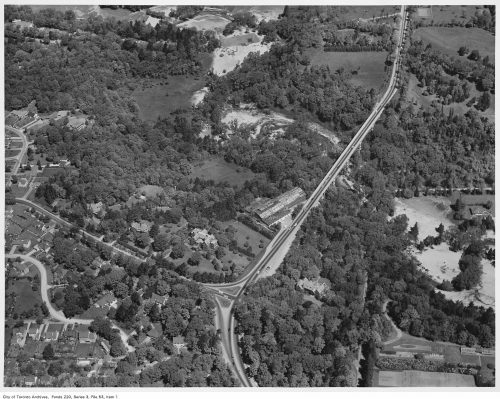 Seeking to preserve the Lawrence Bush woodlot on the west side of Bayview Avenue, Wood negotiated with North York Township to realign Bayview Avenue so that it would curve around the west side of the woodlot. Wood and the Township swapped properties so that the original Bayview would become part of the Woods’ property, while the Lawrence Park properties were transferred to the Township. 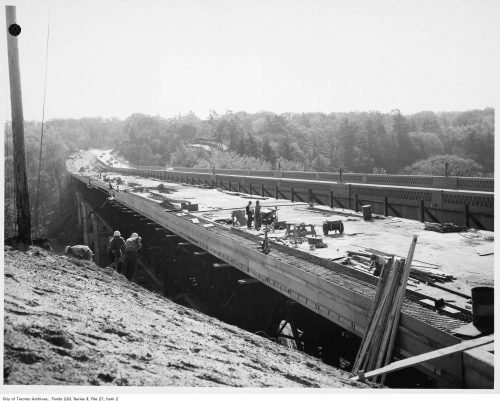 To further sweeten the deal, Wood and his younger brother Frank helped to finance a new high-level Bayview Bridge over the West Don River, which opened in 1929. 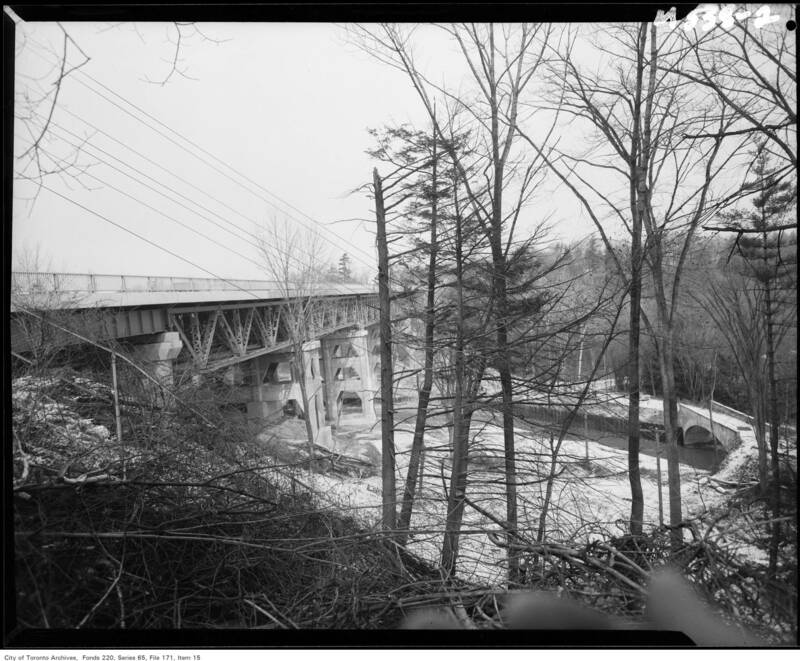 The following photographs show the 1929 bridge, and the stages of construction for a new replacement bridge, built by the Metropolitan Toronto level of government in 1960-61. 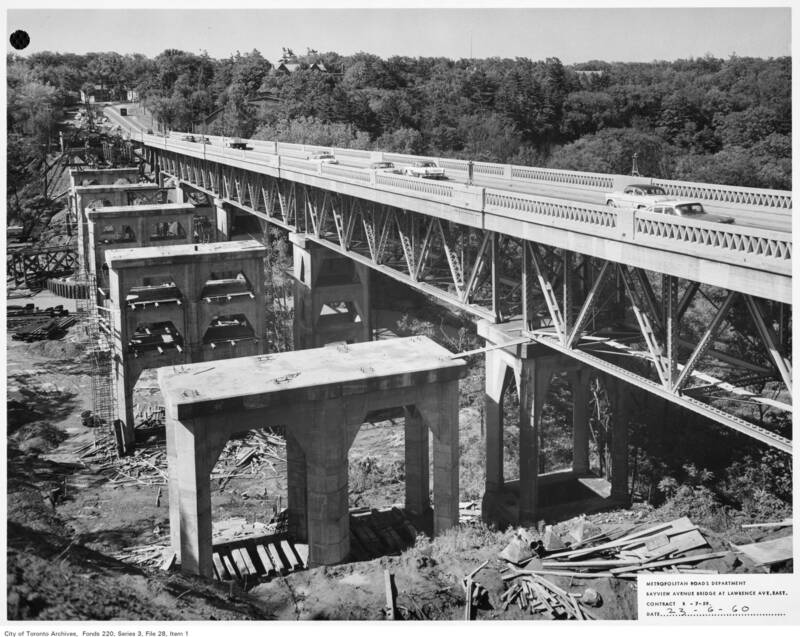 View of the Bayview Bridge built by North York Township in 1929, looking north. By the late 1950s, weight and speed restrictions were imposed, indicating the need for a new bridge. Lawrence Ave. meets Bayview Ave. at the T. Note the Clifford Sifton estate north of the intersection of the two roads, which is now the site of the Toronto French School. The large structure in the centre of the image is the barn for the Sifton family horses. The house surrounded by trees at the lower right is Chedington, built by E.R. Wood for his daughter Mildred in 1927-28. This house was gutted by fire on October 30, 2009, and demolished in 2013. Construction of the piers for the new part of the Bayview Bridge on the east side is well underway. 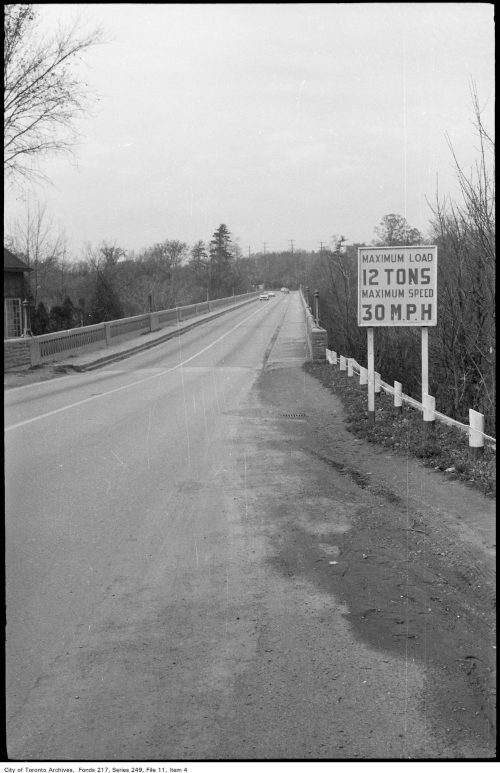 Meanwhile the old bridge remained opened for two-way traffic. The design of the concrete piers mimics that of the 1929 bridge. In this view looking north, workmen are shown placing structural steel trusses. Work progresses on the roadbed and pedestrian sidewalk for the new bridge. 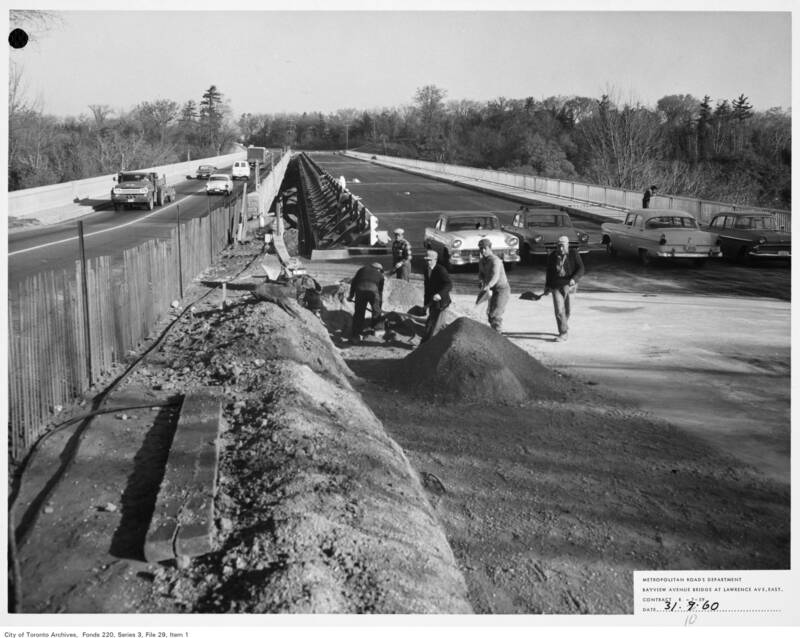 Construction workers’ cars are shown on the south end of the new bridge, which is substantially completed. 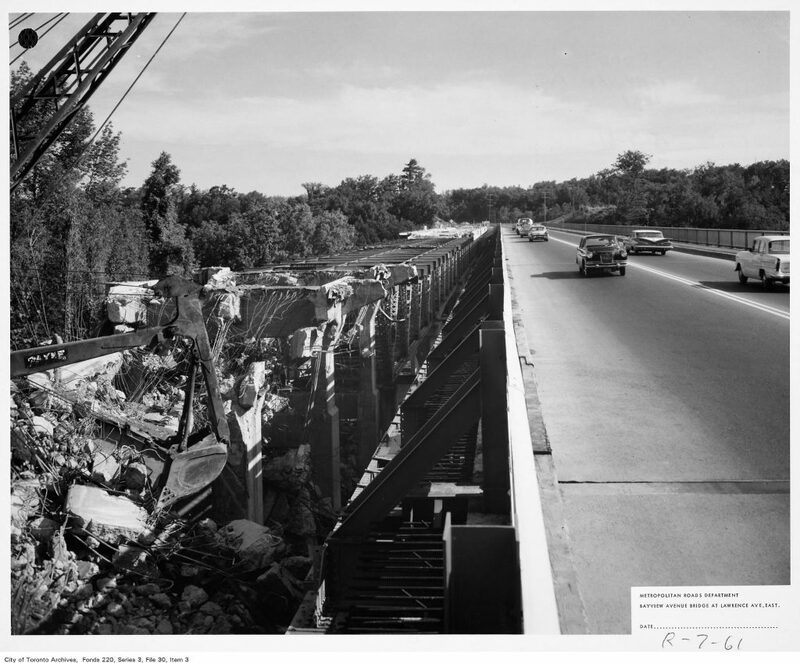 Note the gap between the old and new bridges. Photographer: Hunting Survey Corp. Ltd. In this aerial view looking north-east, cars can be seen travelling on the new east side bridge. This view looking down into the ravine shows a small, arched bridge over the West Don River at the right of the photograph. 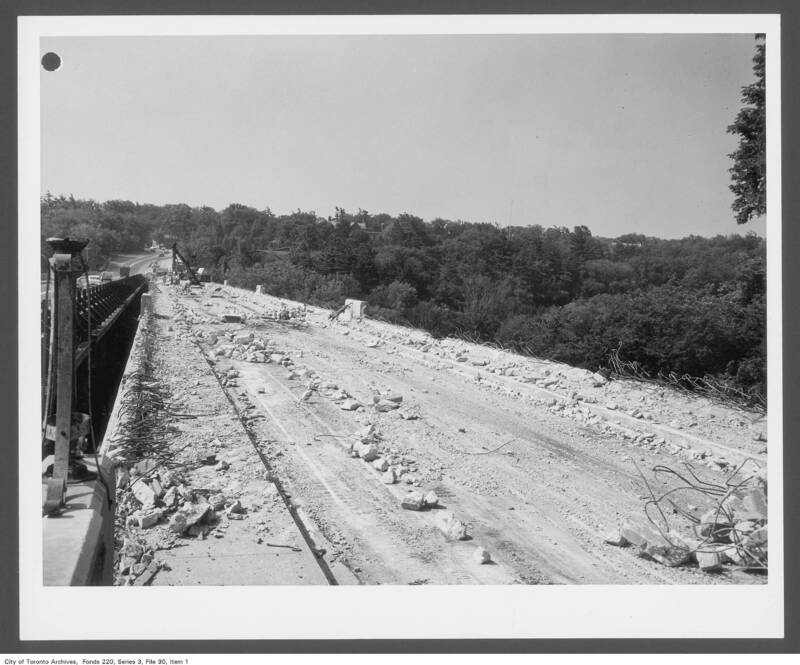 Known as Watson’s Bridge, it was built in 1895. 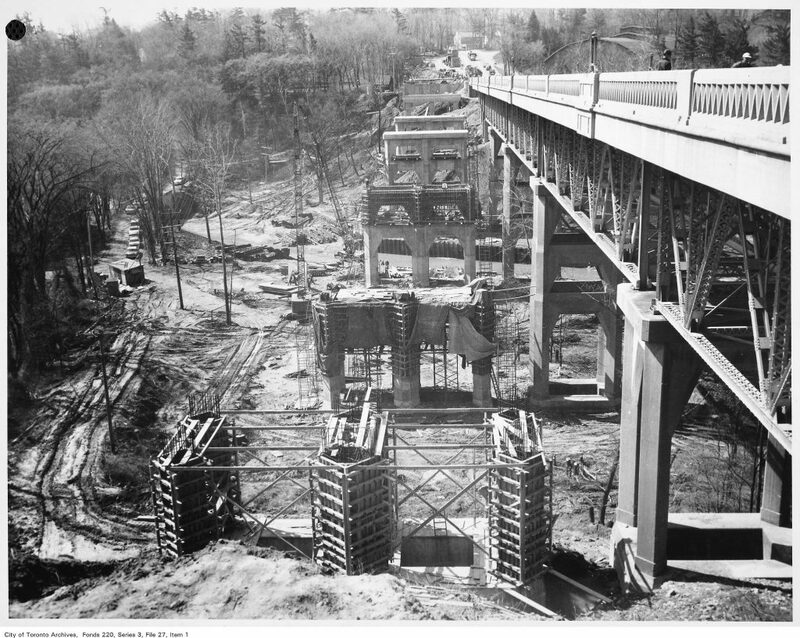 This bridge can still be seen if you travel to the end of Lawrence Ave. E. near the Crestwood School, on the east side of Bayview Ave.
Demolition and removal of the reinforced concrete abutment piers, bridge deck and structural steel trusses has begun on the old bridge on the west side. More demolition. 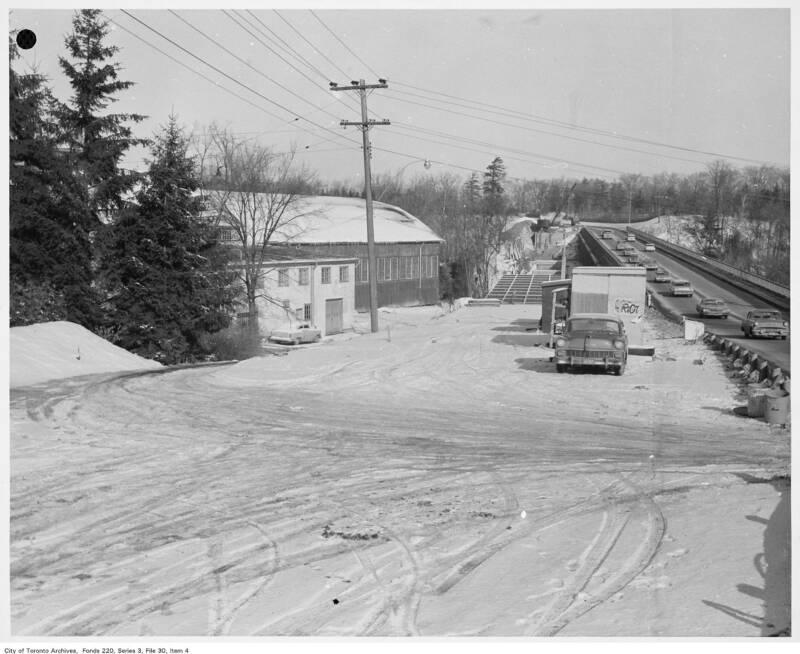 This image provides a good view of the horse barns on the Sifton estate, near the south end of the bridge. 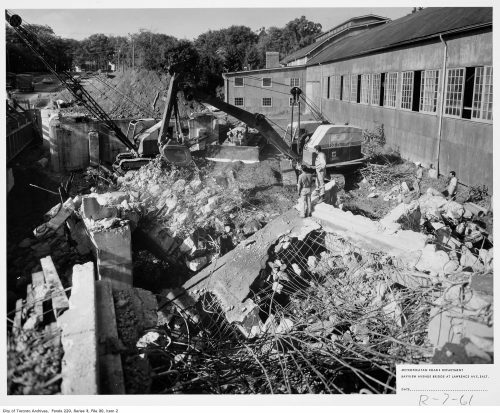 In this view, the phases of the demolition are shown, moving from the south end to the north. 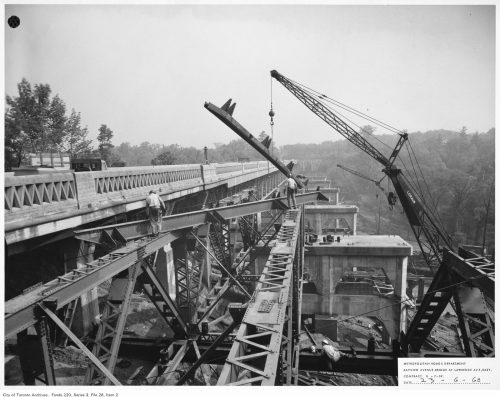 Demolition on the old bridge is now complete, and work has begun at the south end to install the new structural steel. With a bigger bridge, traffic chaos ensued at the south end where Lawrence and Bayview meet. 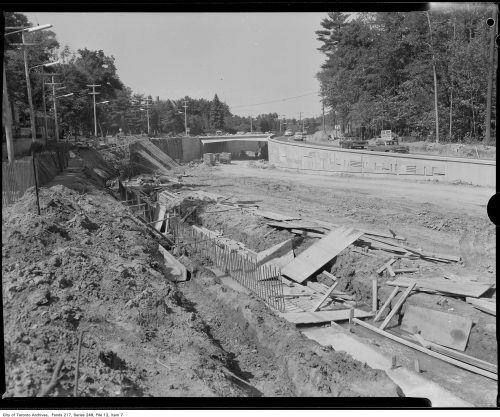 To deal with this, an underpass was built to allow Bayview traffic to sail through under Lawrence, while cars travelling between Lawrence and Bayview used new approaches. The attractive decorative touches on the underpass are still visible, though sadly faded. The work is complete at the intersection of Lawrence and Bayview, and traffic is flowing. This aerial view clearly shows the westerly curve in Bayview Ave. around the former estate of E.R. Wood. 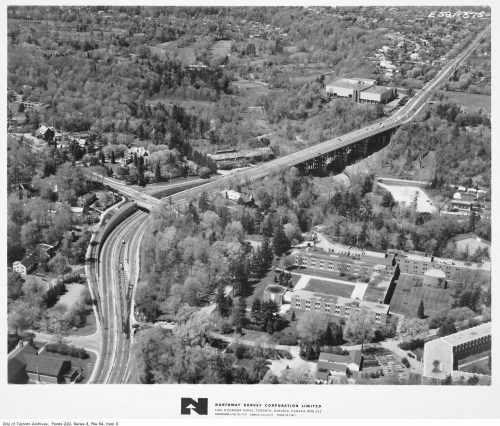 The earlier alignment of Bayview can be seen in the straight road at the lower left. 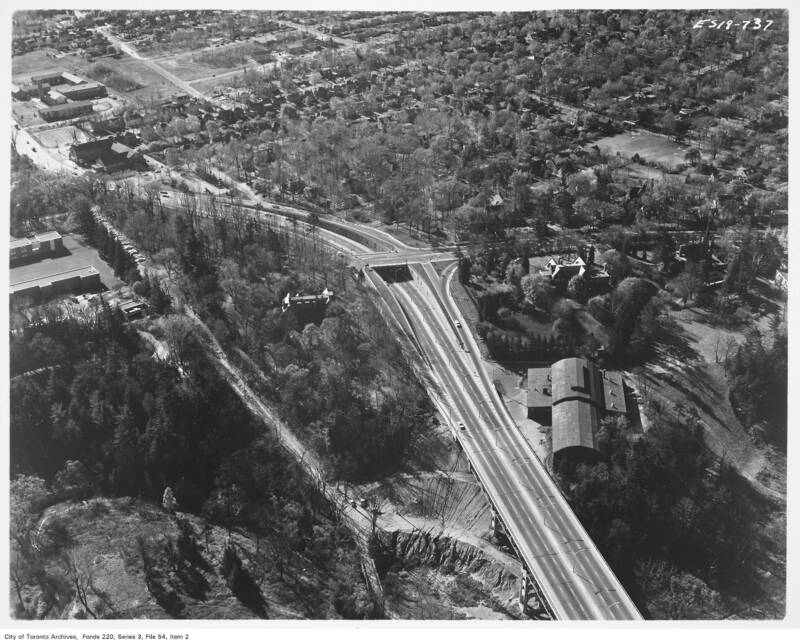 York University’s Glendon College campus is at the far left. Photography: Northway Survey Corp. Ltd. This view looking north-west shows the two bridges joined seamlessly over the West Don River. The Glendon campus is at the lower right; Chedington is near the middle, east of Bayview; and the Crestwood School is at the centre right in the valley.